RIO DE JANEIRO, BRAZIL – Explosives brought a one kilometer section of Rio’s Elevado da Perimetral in five seconds on the morning of Sunday, November 24th. 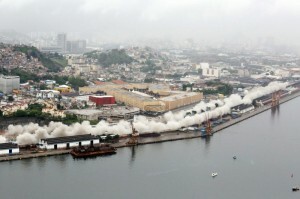 Located in Rio’s Port Zone, the section of the important highway was demolished by the city government at 7AM. Explosives brought Rio’s Perimetral down in five seconds on Sunday, November 24th, press image/Mayor’s Office of Rio de Janeiro. Approximately 1,200 pounds of explosives were used to destroy the section of road in order to make way for construction in preparation for the 2016 Rio Olympics. The implosion brought down 232 steel beams, weighing more than five tons onto over 2,000 sand-filled tires placed under the overpass to cushion the falling debris. A cloud of dust replaced what had once been the Perimetral, one of Rio’s most important arteries, after only five seconds. Paes said that the debris will be reused in future construction projects and the clean-up process should take approximately ninety days. The stretch was removed in order to open the area for the construction of an expressway which will link the South Zone’s Aterro do Flamengo (Flamengo Park), Avenida Brasil and the Rio-Niterói Bridge. The remaining sections of the Perimetral are loosely scheduled to be demolished in January or February 2014. Brazilian government keeps asking us to use public transport, but what happens is that Brazilian people prefer to use their cars because our public transportation is really bad. The buses are always full, delayed, and it takes them more than it should to get to their destination. The municipal, state and federal governments should be ashamed of the quality of roads and streets we have in this country. We pay our taxes, more than they should be, since the road conditions are terribly maintained. They say we have to use public transport, but they go to work in their very expensive cars. Give us a break! Improve the quality of the highways first. Ubiraci’s comments are totally correct. The situation with the transport in this city is a joke. Buses are badly maintained, dangerous and pay no respect to the rules of the road. Intersection blocking is totally ignored and the roads are in such a state as they risk causing serious accidents. The city doesn’t like cars? The city doesn’t care for commuters full stop. Alternative forms of transport seem restricted to the buses (dangerous) and vans (even more so). Try cycling in this city and you will risk your life. The metro is overcrowded and features two lines and if trams exist in any borough I don’t know about them. The removing of perimetral is visual, it already was a superhighway linking Aterro to the Niteroi bridge. But the best quote above is “We prioritize people walking the sidewalks”, walking the sidewalks around Gamboa, particularly at night would get you into a lot of trouble. Rio de Janeiro is a beautiful city that has been left to rot for the past 30 years, its current local government continue to let it decay, these projects are for the Olympics and they are just show.